We are delighted to announce a fantastic evening’s entertainment planned at the School in aid of the Whitgiftian Association Bursary Appeal. Pip Burley OW (1955-62), Executive Producer of the Darling Buds of May and A Touch of Frost, presents “The Golden Age of Song”, celebrating the lives and works of the four greatest songwriters who ever lived. 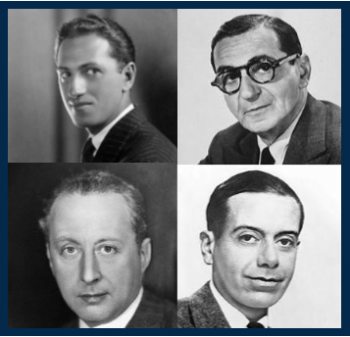 Pip will pay tribute to the lives, words and music of Jerome Kern, Cole Porter, George Gershwin and Irving Berlin – four men who defined popular music during the first half of the last century. Come and enjoy their beautiful songs – as fresh and inspiring today as when they were first written – and hear about the triumphs and tragedies of these musical geniuses who cast their spell on us. Lavishly accompanied with slides and videos of their lives and music, with occasional illustrations on the piano and with a delicious dinner in the interval. This is an amazing opportunity to share Pip’s unique insight into the lives of these fascinating songwriters. Pip is generously providing this evening in aid of the Whitgiftian Association Bursary Appeal so that talented youngsters who can’t afford the fees are able to have their lives transformed with a Whitgift education.